In less than three minutes tickets to the UFC biggest card of the year, UFC 229, sold out. The mere presence of Conor McGregor practically guarantees the success of an MMA event, but add in a belated return and a bitter rivalry between Conor and his scheduled opponent, this one seems special. Let’s see why. It’s been a strange year. Not a bad year by any stretch of the imagination, but a strange one. If 2017 was a soft reset for MMA, then the first half of 2018 was perhaps an awkward adolescent stage. Nothing seemed to be going as planned, divisions were being held up for various reasons, and the biggest stars were either making the jump to WWE or on holiday. UFC 223 was meant to serve as a kind of reconciliation for at least the lightweight division, giving us a new direction and settling old beefs. Then, we got to fight week, and a series of bizarre misfortunes struck the UFC, not least of which was the unusual return of one Conor McGregor. On April 5th, two days before Brooklyn was scheduled to host a stacked card, Conor McGregor resurfaced in the bowels of the Barclays Centre, flanked by his teammates. As several fighters were leaving the building, “the Notorious One” made the unfortunate decision to launch an assault on the bus carrying them. Him and his cohort threw items at the bus, most notable of which was a dolly, smashing several windows and cutting up a number of fighters. Why? Because Khabib Nurmagomedov was on that bus; the man on the verge of seizing the 155 belt once held by McGregor. Conor’s motivations were murky. Most postulated a retaliatory effort after Khabib’s less than friendly confrontation with McGregor teammate Artem Lobov earlier that week. Whatever the reason, things presumably went further than the Dublin native had initially intended, and he inadvertently injured both Michael Chiesa and Ray Borg, forcing them off of the UFC 223 card. 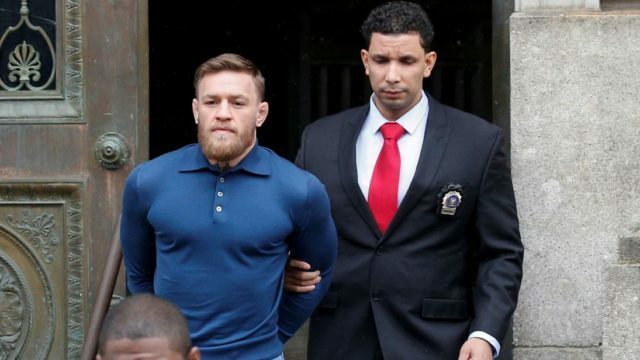 McGregor turned himself in later that night. After the immediate shock, eyes turned to Dana White. We hoped for condemnation and promises of punishment. The UFC President designated “disgust” as his buzzword, giving it a thorough drubbing in response to the media. He used it adequately, admonishing the former champ champ’s actions and giving everyone the lambasting they were hoping for. Until this refrain. During an interview with ESPN, White was asked “do you want to be in business with Conor McGregor?” His response? 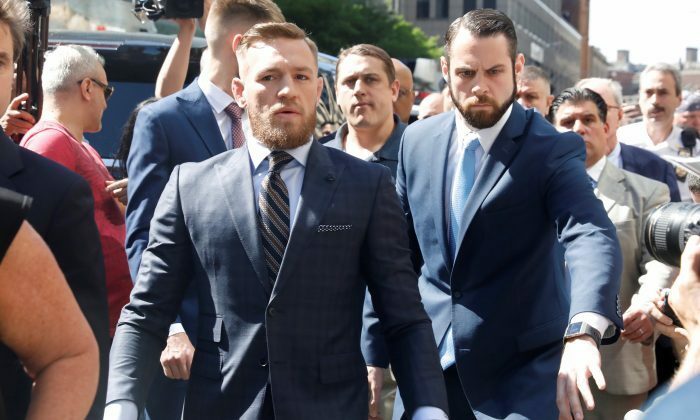 “Yeah, no, right now, no.” He continued, “I mean, do you wanna be in business with Conor McGregor right now? I don’t think anybody is gonna wanna right now.” “Right now.” Of course, surprise should be the last emotion here. It’s slippery sentiments like this that have framed Dana White as a figure of distrust and borderline contempt to many MMA fans. “Right now.” An aperture into the timeline, that day’s episode of UFC embedded (link) featured the bus attack as its central theme, accumulating, to date, 5 million views on YouTube. With a court date looming for Conor McGregor, the UFC wisely held off on making promises. 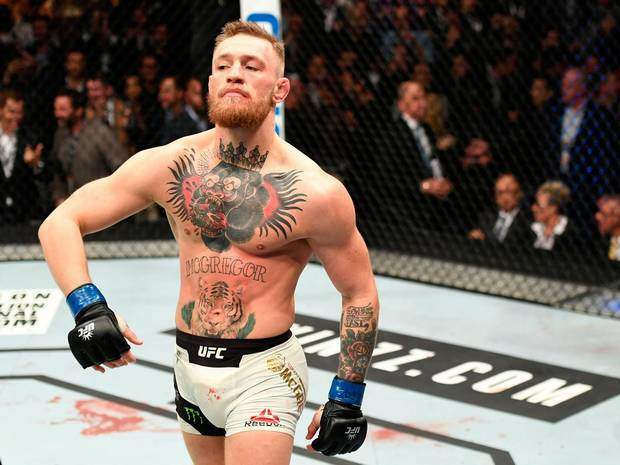 In the months since, White has been asked several times about the return of McGregor, to which he defers to the potential reparations required of Conor. His stance on the nature of the deed cooled far quicker than many might have assumed given his extreme “disgust” in the immediate aftermath. In fact, not four days later at the post-fight press conference (link), Dana said this, “At the end of the day there’s a lot worse that goes on in (*small chuckle) all the other sports. So, I’ll take a dolly through a window any day.” Four days! I’ll quickly remind you that Ray Borg got actual glass in his actual eye ball. Fast forward to August, McGregor only finds a paltry five days community service and a handful of anger management classes between him and emancipation. So, prior to UFC 227, the UFC held themselves a little 25th anniversary press conference. Conor McGregor and Khabib Nurmagomedov were absent, but in their stead was a video package formally announcing their clash at UFC 229 in October. The driving force behind the propaganda: the bus incident. The UFC used an actual, convicted act of assault as a promotional tool. From a “disgusting act” to premium hype in less than five months. Sports are a funny thing. However, do you not feel the seedy and illicit excitement in the pit of your stomach? In truth, would you have it any other way? The logical, civil side of us recognises this is a ludicrous thing to do, evincing the UFC’s corruption and corporate amorality. But the fan in us, it wants the drama. How often does an already raging and hypnotic fire get this kind of rocket fuel added to it? Two fighters, a legitimate act of criminality undertaken in the name of their feud. Khabib’s response to the attack: “send me location”. The champion seeks reprisal in the cage, one on one, evening the score. It’s ridiculous and melodramatic and farcical, but its real, and raw. Is this not what we crave in combat sports? Parameters in which real stories can play out with real consequences, right or wrong. A beautiful flash point of chaos, sinfulness and realness is being delivered to us, and we know it’s wrong – it feels wrong, but it feels so right. We want legitimate accountability and responsibility when people do bad things, but the human in us, the consumer of stories, wants to see things play out with dramatic structure. McGregor doing time and being blacklisted from the sport does not satisfy this primordial need, directly contradicting our logical minds. Put in the UFC’s position, would you have not have done the same? Would you not have used the bus incident as the crowning jewel in this build? If anyone else had done what Conor did, they would almost certainly be facing harsher penalties. But money talks, and drama sells, which is why UFC 229 tickets sold out in three minutes at such steep prices (ignoring the presence of scalpers and bots). This is the sport we chose, and it’s important to know our compromises, and the sacrifices we’re willing to make for a good story.